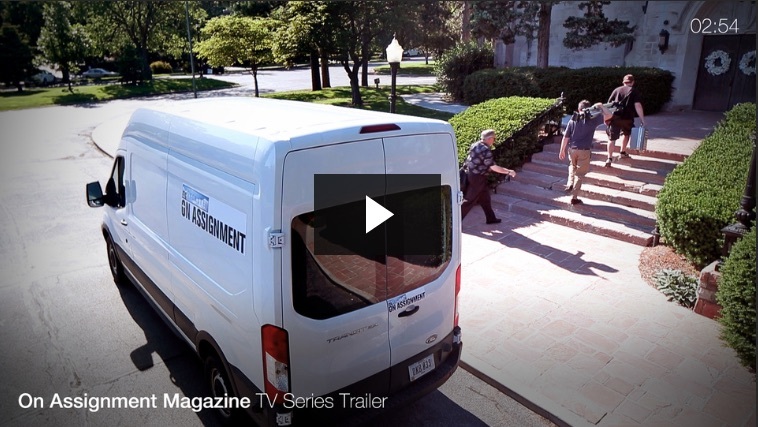 On Assignment Magazine is an on-the-road TV series investigating true stories of hope around the country. Here at StoryTel Foundation, 2015 has been dedicated to the creative development of Season One, as well as a few side projects God put on our agenda. We're excited to present to you our Season One trailer, which shows what the new series is all about. As you travel with us on the series, the StoryTel crew will be your personal detectives, scouring the country for clues that lead to the conclusion that God is present and operating in our world after all. In a culture that often obscures God's work, On Assignment Magazine is a magnifying glass uncovering a true vision of hope to compel all of us to unlock the sacred. In each episode we'll investigate several cases of ordinary people doing extraordinary things for God. We'll share their stories with numerous people through various TV and Web channels and inspire more audiences than ever to trace God's footprints on their own roads. Please help us bring our new TV series to the airwaves! But our ongoing investigation will stall without sidekicks. We need financial support to keep the van running and the cameras rolling. Please send us on the road to capture these stories for you, your family, your friends, and, most importantly, for God. March 24 marks the 8th EWTN broadcast of the StoryTel film Where Heaven Meets Earth since its premiere in April 2013. In this documentary, ON ASSIGNMENT investigates how a poor Catholic church became a thriving and vibrant parish again after more than 40 years of steady decline. StoryTel Foundation was sad to learn of the death of Notre Dame law professor emeritus Charles Rice last week. But we are glad to have had the chance to meet and interview him nearly 20 years ago. In 1996, well before the name StoryTel was conceived, Don and I were asked to interview Professor Rice when he was visiting Southern California. He was a big proponent of Thomas Aquinas College and actively sought graduates to attend Notre Dame Law school. He particularly appreciated their analytical minds and predictable commitment to the Faith. Rest in peace, Charles Rice. We're so excited to have our story told in the oldest nationally distributed Catholic newspaper in the United States! We've always made sure to keep StoryTel out of the spotlight in our documentaries and focus the attention on the parishes, religious orders, organizations, and individuals across the country collaborating with God to restore the sacred. Today we're grateful to have the spotlight on us. We hope this National Catholic Register article will build more support for our mission to inspire through film. You can find the article in the Arts & Entertainment section of this week's paper or read it online: Restoring the Sacred, One Documentary at a Time. As we thank God for another exciting year at StoryTel Foundation, we also want to thank you for your generous support. Without your prayers and contributions, we would not be exploring and restoring the sacred and inviting millions of viewers to do the same. What a year we've had! We celebrated the completion of our fourth full-length documentary film, danced a jig over a burst of press coverage about StoryTel, celebrated as our online video views broke 24,000 and cheered madly as our Miles Christi documentary premiered on EWTN to 230 million homes around the globe! Reminisce with us as you take a look at our 2014 film project highlights. These victories are yours as much as they're ours, but ultimately every inspired soul is God's victory. Plus, get a sneak peek at our plans for next year, including a new TV series format, a second partner TV station, and an exciting vocations project. Many of the people and organizations whose stories should be told don't have any money to pay us for our services. That's why we need your help to serve them and continue creating impactful media productions that will foster reverence for God and the things of God. As a 501c3 nonprofit foundation, none of our work would be possible without God's help, and yours. Please consider making a tax-deductible donation today to help StoryTel in 2015. We, too, are sanctified through the making of these films. Thank you for providing a vehicle for holiness in our own lives and the lives of our viewers. God's work is always worth it. Our latest film finally aired for the first time today in the U.S. and will continue to premier through the world this week on EWTN's various international stations. Thanks to everybody for their wonderful feedback and many DVD orders. We're so please that so many people are enjoying and appreciating our film. To learn more about our mission our films, check out this great article about StoryTel from the National Catholic Register that was published this weekend. StoryTel On Spirit Catholic Radio! Check out excerpts from Don's in-studio guest appearance on Spirit Catholic Radio this morning. Today Don appeared live on This is The Day on CatholicTV to discuss the work of StoryTel. Father Robert Reed and Jay Fadden asked Don a variety of questions about how StoryTel got started, our past project, and our upcoming film, Miles Christi: Soldiers of Christ in America. Thanks to CatholicTV for the opportunity to be on your show and talk about our work.